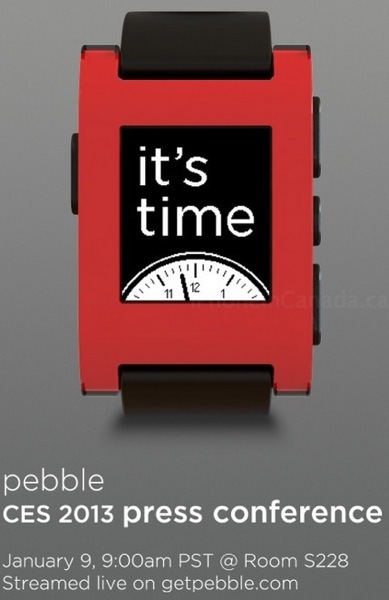 Pebble, the Kickstarter watch project that shattered records, has announced it will be holding a press conference at CES 2013 to announce some “big news”. For those not able to attend in person at CES, you will be able to watch the announcement streamed live at getpebble.com on January 9th, 9:00AM PST. Pebble has not shipped just yet to its backers, but this announcement could be related to its much anticipated launch, or the mention of new features. The image above says “it’s time” on the watch, which would most likely hint a launch. What makes the Pebble watch a potential game changer is its SDK, which has been available to developers to customize alerts and integrate their apps. The Pebble team previously announced it will support RunKeeper at launch. Back in December, the Pebble team sent an update to note the watch would support iPhone SMS and iMessage notifications. Did you back the Pebble watch on Kickstarter?